Systematic Automation is one of the leading UV curing machine manufacturers in the industry, providing state-of-the-art UV curing machines for flat, three-dimensional or cylindrical products. 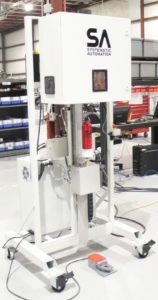 Systematic Automation was established in 1983, and has decades of experience designing, engineering, manufacturing and installing specially designed machines to achieve your UV curing process goals.Systematic Automation has vast knowledge and expertise of UV curing processes, developing our patented UVSP curing machine in 1998, long before the power of UV curing was as widely utilized as it is today. We now manufacture dozens of UV curing machines with several standard size lamps from 6” lamp arc length up to 48”, with even larger sizes available upon request. Contact our knowledgeable staff for guidance on the best UV curing machine for your needs. We have manufactured and installed thousands of UV curing machines, with patented technology, revolutionizing the UV curing process. Our extensive research and development has contributed new and improved technologies, aiding in cost efficient UV processes used in several industrial applications around the globe. UV curing machine manufacturers should be well versed in all aspects of the UV curing process. UV curing is a photochemical reaction used in several commercial and industrial processes worldwide. Exposing certain inks, adhesives and bonding agents to Ultraviolet light will instantly cure them providing a strengthened coating quicker and with less contaminants as other drying methods. Methods that use drying allow for evaporation, which can cause an uneven surface with inconsistent results. Other methods of curing adhesives that utilize chemicals can distribute VOC’s, (volatile organic compounds) into the air causing health problems for employees while still producing an inconsistent process. The knowledgeable staff at Systematic Automation are experts in UV curing machines, and will assist you with the right UV curing machine for your application. Systematic Automation, Inc. is a champion among UV curing machine manufacturers, providing user friendly touch screen curing machines with technologically advanced power supply units, revolutionary irradiator designs with patented technology, and superior UV lamps manufactured with precise wavelength, or Nanometer (nm) customized to your application. We manufacture machines engineered for UV curing of various coatings, adhesives or inks onto different substrates including plastic, glass, paper and wood. These substrates can be of any shape or size such as flat, three-dimensional or cylindrical. Our UV Conveyor Machine is one of the most popular for UV curing of flat products, providing superior performance with up to 400 watts per inch (WPI), coupled with durability, reliability, and simple operation. Our Cylindrical 360 UV Curing machine delivers a consistent process with uniform coverage due to our 360° rotating cure cycle, a uniform cure process is guaranteed. A vacuum table secures the bottle, mug or cylinder in place, allowing the entire print area exposure to the focal point. This spin cure machine employs patented technology resulting from Systematic Automation’s commitment to continual improvement. Systematic Automation provides continual support for all UV curing machines, maintaining supply of specified replacement lamps. Our lamps are manufactured with the proper specifications for your machine, providing long lasting superior performance. We can customize an automated conveyor system to reap further benefits from cost saving automation. Systematic Automation, Inc. provides proven solutions with all UV curing applications of inks, adhesives and coatings. All machines are rigorously tested for maximum performance prior to shipment and delivery. Contact Systematic Automation today, one of the world’s leading UV curing machine manufacturers.